The Jewish holidays are upon us, last week we celebrated the Jewish New Year, and this Saturday is Yom Kippur, the day of repentance. We sit and reflect upon the sins of the past year, those whom we have wronged, and asked for forgiveness. So since this is my public forum, please accept my apologies. I'm sorry if I have wronged you, please accept my forgiveness. But really, I hope I haven't 'wronged' anyone. That's just not really my style, but if I have, I am sorry. So, in preparation for the day of repentance, when you fast all freaking day long, we have to prepare the breaking of the fast meal. My family does not do the light dinner thing, we do the, 'lots of delicious food because we haven't flippin' eaten all day' meal. 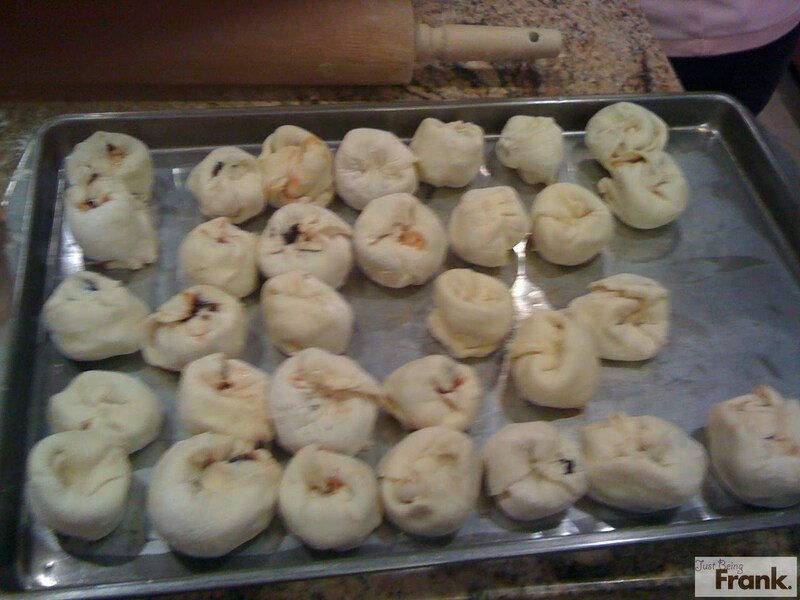 This past week, my mom, auntie, sister and I decided to make knishes for said meal. In our typical inability to estimate proportions, we bought way too much knish wrapping dough. 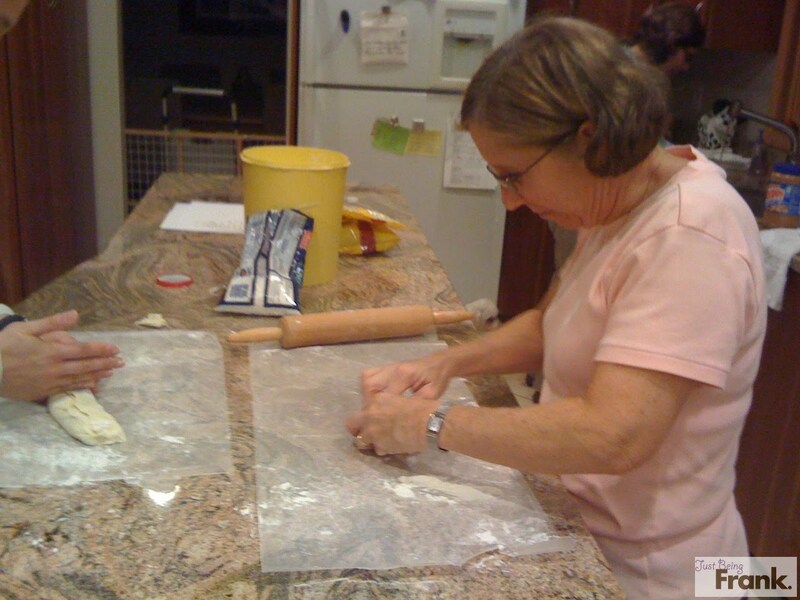 (my grandma Ida used to make the dough from scratch back in the day...yea, we don't so much do that.) So....what do you do with too much filo dough and not enough potatoes? Dessert Knishes. 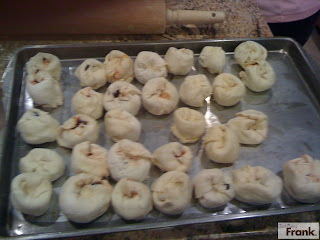 Chocolate chips, peanut butter, coconut, jam...ya know..the way knishes were meant to be. There's a pretty good chance that dessert knishes are going to become a new Weinblatt/Goldman/Miller/Frank/Bass family tradition. If you're looking for a dessert knish, they'll be at our break the fast. At like 3:00. Because otherwise I will waste away and die from fasting all day. Sudden an immediate death upon fasting. In Weight Watchers there is this whole lesson about how, "hunger is not an emergency". I could not possibly disagree more. This past weekend, Jeremy and I attended a wedding for a friend of mine. It was a 2:00 wedding in St. Paul, and a 5:00 reception in Mendota Heights. Our friends Debra and Alex also had another wedding in St. Paul at 2:00 and a reception at 5:00. None of us knew anyone else at our respective weddings, and thus we were puzzled as to what we should do in the interim 2 hours. Once we realized we had the same conundrum...we decided, clearly, we should meet each other at Cafe Latte(a local bakery) in between. While the other guests visited local bars...we visited a local bakery. We sat...ate...compared different wedding notes...decided we would take pictures of different things at our respective wedding receptions and compare notes via picture text...and then decided to wander around Grand Avenue shopping district. We walked into a local boutique and I picked up a black and grey stripped cardigan and tried to put it on. The sales woman saw me struggling and walked over to help. You see, this was not just any cardigan, it was a complicated cardigan. There were several ways to wrap it up, tie it around, and flip it around, so it could be worn in SO many ways. Debra extolled its beauty, Jeremy looked at me quizzically, and Alex buried his head in his cell phone. Unbeknowst to me, Jeremy then turned to Debra and said, "She is going to buy this shirt, she will talk about how much she loves it all day, and then she will go to put it on next week, and will have no idea how to put it on. She is not paying a bit of attention." Well as turns out, I took it out of the bag this morning to put it on, excitedly approaching my brand new shirt...and had no freaking idea how to put it on. I googled, and googled, but could not find instructions for shirt application. Not wanting to prove Jeremy correct, I wrapped myself all up in this shirt, and marched off to work. It is quite possible I look like a total dork right now. I have it somehow twisted around my neck. Anyone want to come to my office and tell me how to put this thing on? That would be peachy. Done! Afterall, I have to start the year wrong-free!